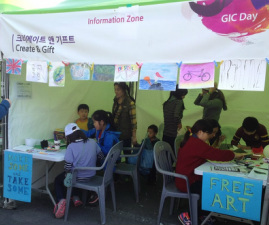 The Gwangju International Center invited C&G to provide an art booth for Gwangju residents attending its event, Adios Day. The GIC is relocating, so they wanted to celebrate the last few days of the cherished building that served as a home to the GIC for many years. A flea market, live music, and pot luck were some of the other booths enjoyed at the event. Create & Gift was honored to hold an interactive booth at the event. C&G brought the art supplies (e.g., paper, markers, watercolors, pastels). Gwangju residents brought the ideas. The bustling event brought faces from around the world, both young and old, to the booth to create and receive art. The display of available pieces changed every few minutes as people rushed in and out, leaving a new piece and taking one home. Only two weeks after Create & Gift's inception, the concept was introduced to the community. With a wall dedicated to C&G in Adam Greenberg's gallery, community members were encouraged to take a piece of art home for free. Giftees expressed gratitude for the artwork and were inspired to create a piece of art themselves.